Image above, clockwise from top left: The wedding couple’s face on a tattoo (temporary), tattly diamond tattoos (temporary), card face tattoos (permanent), hearts on ring fingers (permanent), matching circle halves instead of rings (permanent). It wasn’t a tattoo, but my friends Mark and Shirley, used an Hermes bangle instead of a ring because, and I wish I remembered Mark’s words exactly, the love Shirley had to share was far to great to be encapsulated by a ring. My husband and I have tattooed wedding rings! We used silver James Avery rings for the ceremony, and then got our fingers tattooed as soon as we could find a good tattoo artist who would tattoo fingers (many won’t). We were told to make sure our design was not too detailed and had enough blank space between the letters (we got the Hebrew word “kabod”, which means weight or glory, in reference to our wedding song “The Weight” by Thrice) since finger tattoos tend to bleed out over time. Three years later, they still look perfect! my husband and i did temporary tattoos for our wedding favor. they were drawn by his tattoo artist and were so symbolic of the two of us! we also have about 200 left over and hate to throw away. one of my absolute favorite parts of our wedding day. These are awesome! However, I’d love to interject here as someone with NUMEROUS hand tattoos and finger tattoos. While many of these look great now (I’m looking at you, heart-under-ring-finger-tat), most people who are getting these do not or will not accept that in less than a year and not to mention many more, these will be worn, falling out, fading, and looking not great. A great number of hip young adults and older young adults who see these cutesy tats will expect these to look blog-ready far down the road, when they will definitely NOT be. Just a word of warning, folks. Top side of hands/fingers, thin lines, a good artist, and proper care (NO rings worn over them!) will ensure a longer lasting, better looking finger/hand tat. Just wanted to put that out there as many people see these pictures. I once thought those rules didn’t apply to me, either, but your skin will say otherwise. My family had temporary tattoos made for my wedding as a gag. They put my husband’s name in a heart a la ‘I love Mom’ tattoos. At one point in the ceremony, the entire bridal party left to apply them. We have so many great shots of folks sporting their ink! I love tattoos, especially simple ones. Love the heart on the inside of finger so classic . Adorable ideas! My man & I have been together for over 7 years but plan to only get married when EVERYONE has equal rights to marry who they love. My friends have corresponding MR and MRS Pacman tattoos that are really cute.. they are eating a line of dots that line up to each others.. total nerds. Agreed with Effie. My husband has his ring tattooed 11 years ago, and it is not the same. I chose a traditional ring but have his name tattooed in a lovely script on my back. It, too, is also starting to all bleed together. Think carefully before doing this! I’m happy to report that while I might regret the tattoo, I do not regret my choice of men. It’s true, tattoos on the fingers can fade and not look so great as the years go by, because hands are constantly exposed to the elements. Sunblock is muy importante. But my husband and I must be doing something right because our tattoo rings that I designed still look fairly good after 13 years- – though maybe a touch up might be in order! And yeah, it was the most painful tat I had done, for me and the poor artist who did it. On the bright side, we have never lost one down the drain or on a beach! Not too sure about a real tattoo but love the temporary ones and they would be a great item to put in a guest goodie bag. So adorable, always wanted to get a love tattoo! May have to do it now, but come up with my own quirky idea! LOL! The Beatles knew about love. and the two half circles are cute, too…. very subtle. A little off topic… I love the neutral lace shoes! Does anyone know who made them?? We had temporary tattoos at our wedding and guests loved them! They were banners that either said “Love” or “They Love Each Other” (yes, like the Grateful Dead song). We had them in our “bourbon saloon” area and people had a great time with them (as seen – https://www.weddingpartyapp.com/e/JkS5zSD) and they also conveniently took place of favors. I like the idea of temporary tattoos for events. I have a few real tattoos and my husband has none. I’d really like for us to agree on a couples tattoo some day. Hmm…..some of these would require serious consideration. My girlfriend is about to get married and her husband-to-be got a celtic wedding ring tatoo on his ring finger – for his FIRST marriage! They now have to choose a rather wide wedding band for THIS marriage in order to cover it up. I LOVE! the X O tattoo…Hmm…maybe I could talk my honey into that one!!! My husband and I have wedding tattoos! I have a heart and he has an anchor. I wear a wedding ring and have mine just above my wedding ring but he is a builder so he doesn’t wear a ring. We love them and got them done on our honeymoon! I really like this idea, whether temporary or permanent. My husband and I have traditional rings, but we got tattoos of each other’s initials in Old English characters on our 2nd anniversary and love them! I’m really leery about tattoo’s of husband’s, wife’s, boyfriends, girlfriends, and especially ring tattoo’s. I say, if you want a tattoo of someone you love, your mama, daddy and kids should be the only allowed. The divorce rate is just too high. And EVERYONE says they’ll never get divorced, but it happens. I say, stick with a ring!!! Only just discovered this post (via Pinterest), and I love ALL of these – but especially the ‘secret’ ones like the two halves which make up a heart when the couple holds hands :-) Love, love, love this post. My husband and I got matching flamingo silhouettes tattooed on the last day of our honeymoon, as we had real flamingos at our wedding at Kensington Roof Gardens and we ended our honeymoon roadtrip in Las Vegas so flamingos was a running theme, and we flamin-go well together I guess! 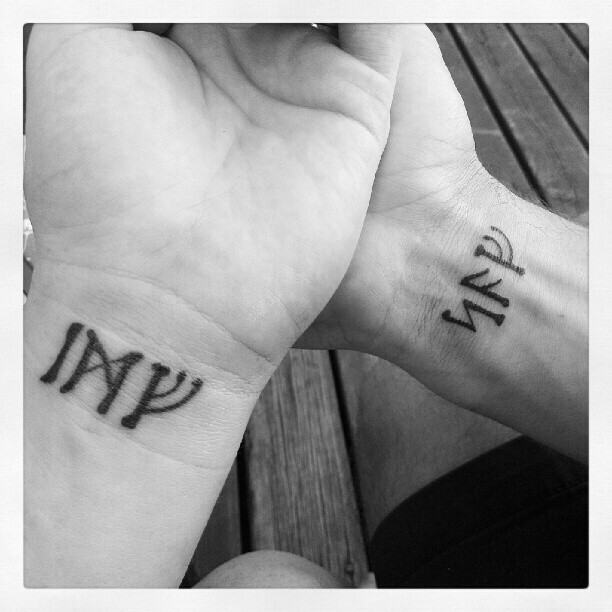 My fiance and I are getting each others signatures tattooed on the inside of our wrists.